Don't Say Vanilla...say Adams Best! 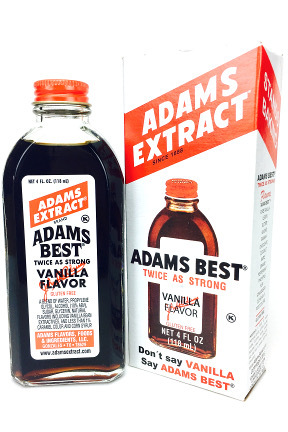 Originating in Beeville, TX in 1905, John Adams set out to create a vanilla extract that would survive the abuse of the everyday housewife. After several attempts, Mrs. Adams used Mr. Adams' formula in her favorite poundcake recipe and exclaimed, ''John, you have made your best!'' And Adams Best was born! From it's humble beginnings being sold door to door to your local grocery store shelves, Adams Best is a favorite of bakers around the country and doesn't bake or freeze out and enhances a variety of desserts, puddings, cakes, custards, ice creams, and cookies. ingredients: a blend of water, propylene glycol, alcohol (10% ABV), sugar, glycerin, natural flavors including vanilla bean extractives, and less than 1% caramel color and corn syrup.